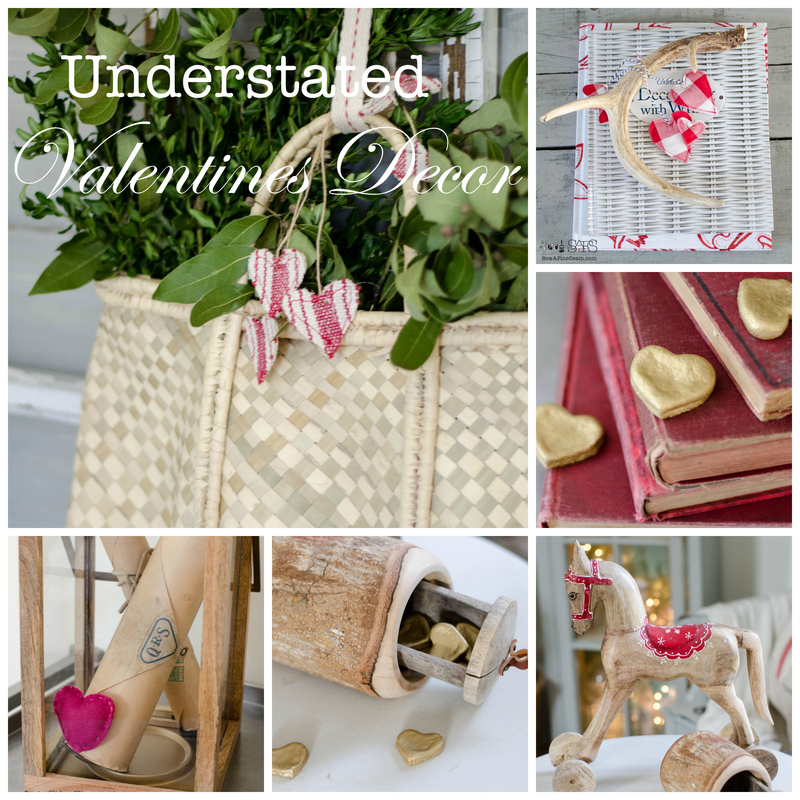 Before we get into the Valentine’s Day decor – did you enter the giveaway yet? I posted it yesterday and you can enter here! Do you decorate for Valentine’s Day? Do you go over-the-top with hearts and cupids and pink and red? Opt for some understated Valentine’s Day decor that just hints at the season? Skip it completely and call it a ‘hallmark holiday’? I don’t go all out, and if the few things I have that are Valentine’s day decor don’t make an appearance at all I don’t stress over it. I don’t have a lot of decor that is strictly Valentine’s Day decor. And what I do have is pretty understated. However it’s not hard to go over-the-top with it if you want to host a party some year for Valentine’s. A trip to the Dollar store will easily meet the needs for all things red, pink, and heart-shaped! The first thing I did this year was to drop this adorable, hand-made, felt heart into this display with my vintage player piano rolls. My ‘baby’ made this for me last year. I can’t imagine Valentine’s decor without it – decor with meaning and memories is my favorite. 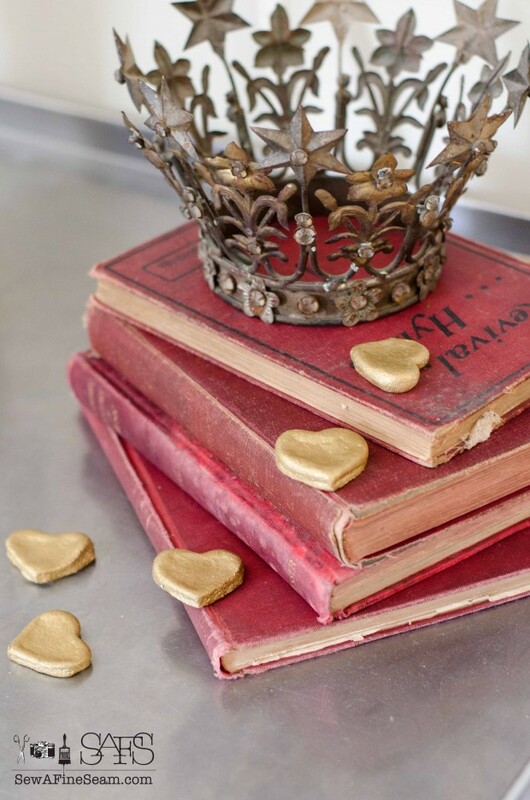 These old red books are the perfect decor addition – they work any time of year, especially at Christmas or Valentines for a pop of that vintage red color. 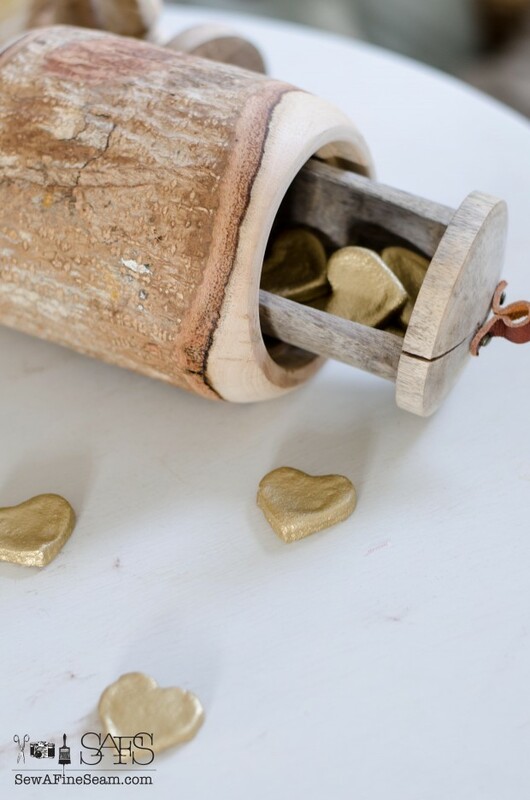 A few more gold salt-dough heart in my wood log-box and on the table. 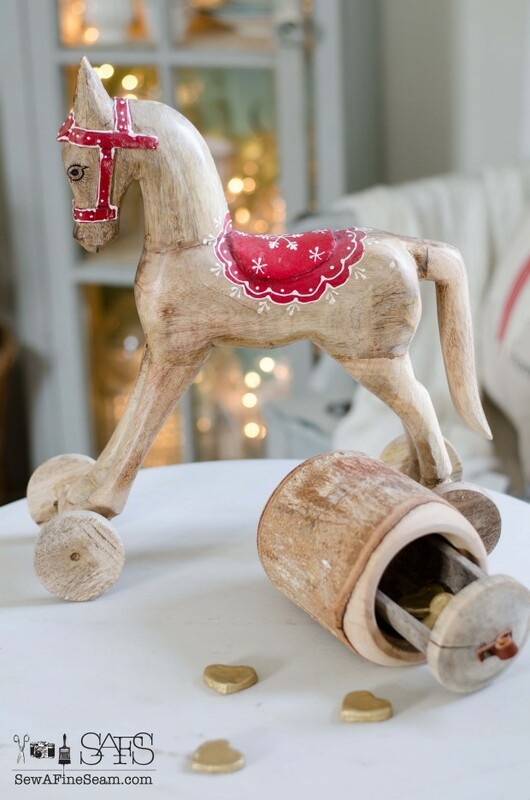 The wood horse from Christmas stayed put when the other Christmas decor was packed away. I’m contemplating a little makeover for her come spring – but for now her red accents go nicely with the season. 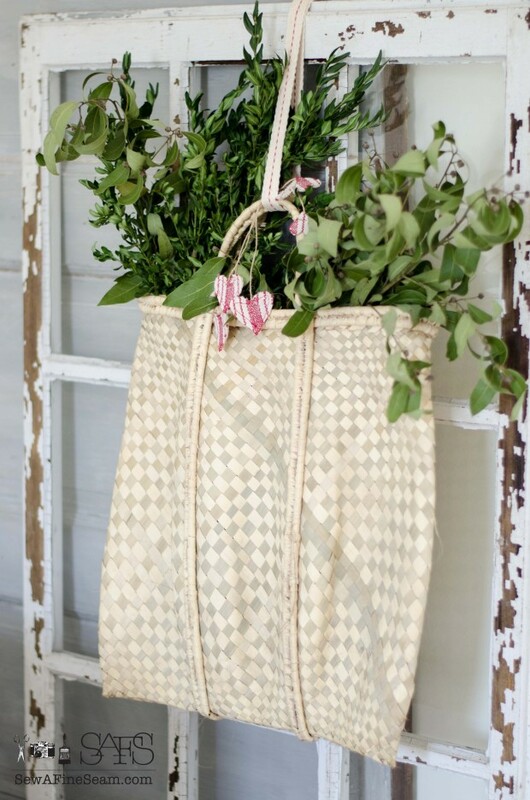 My basket bag from Haiti filled with greens from Christmas stayed too – I added a few miniature, toy tea-bags to add a bit of Valentine’s Cheer. 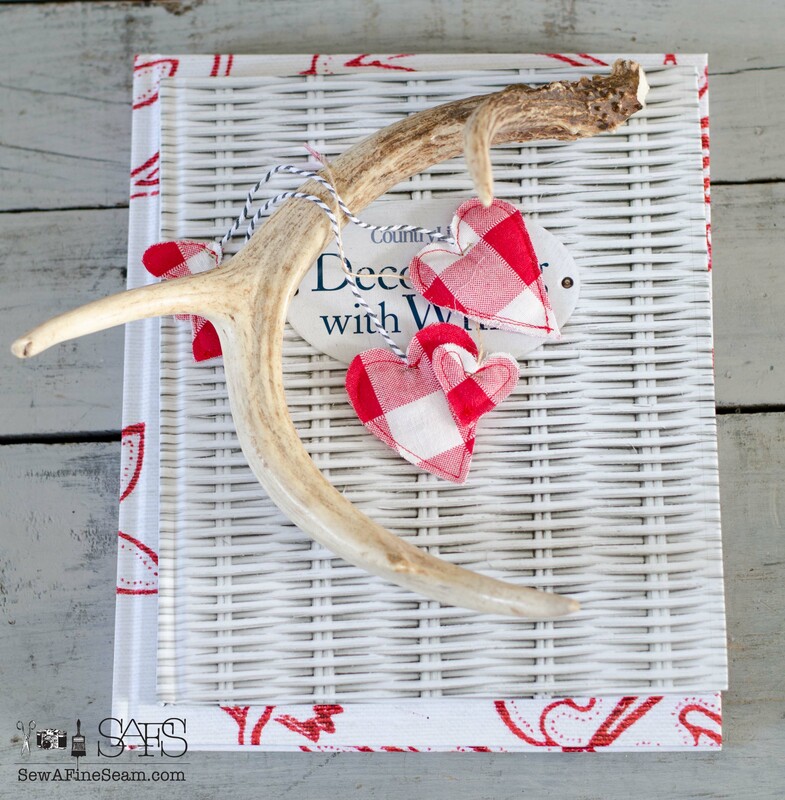 More toy tea-bags, full size and a miniature, were added to the books and antler on the coffee table. 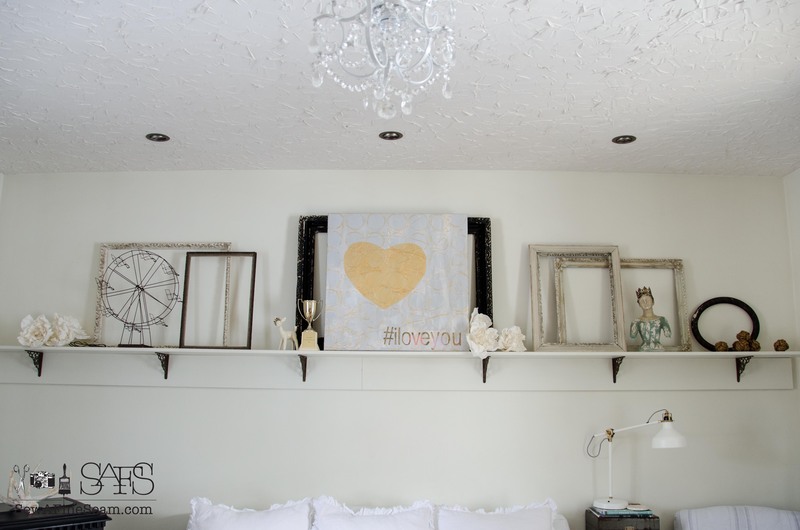 The biggest Valentine’s Day decor item this year is my new artwork – made the large painting as my project for the Monthly Project Challenge I’m doing this year. You can see how I did it here. I styled the whole shelf after doing the photo shoot of just my artwork. I love how the artwork works for Valentine’s Day but also would work year-round since the colors are not your traditional Valentine colors. One of my pillows found a home on this old chair that I have yet to get the seat replaced. 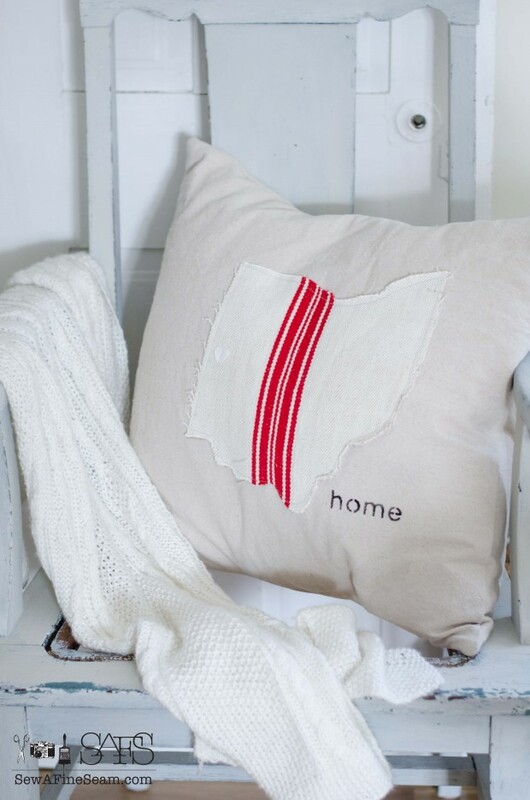 I like how the state of Ohio is ‘heart-shaped’ and I love the grain sack fabric so this one became mine. I make these for wholesale clients and sell them in my shop too. 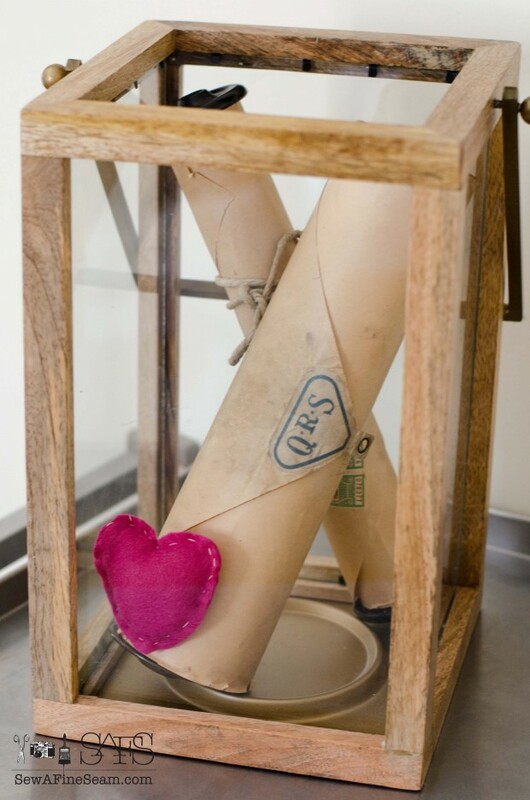 They can be personalized – heart on any location, and I can do any state! You can find them for sale in my shop! I like your Valentine touches. Laughing and sympathizing with T! 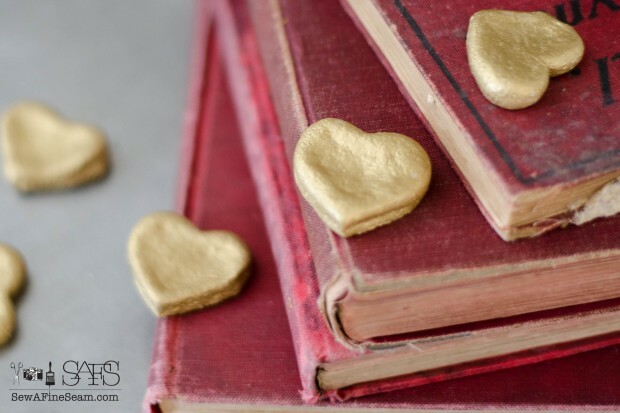 The up side to the gold salt dough hearts is they don’t disappear like they would if they really were candies. I need some of those. I love the look candy adds. Love the heart B made. 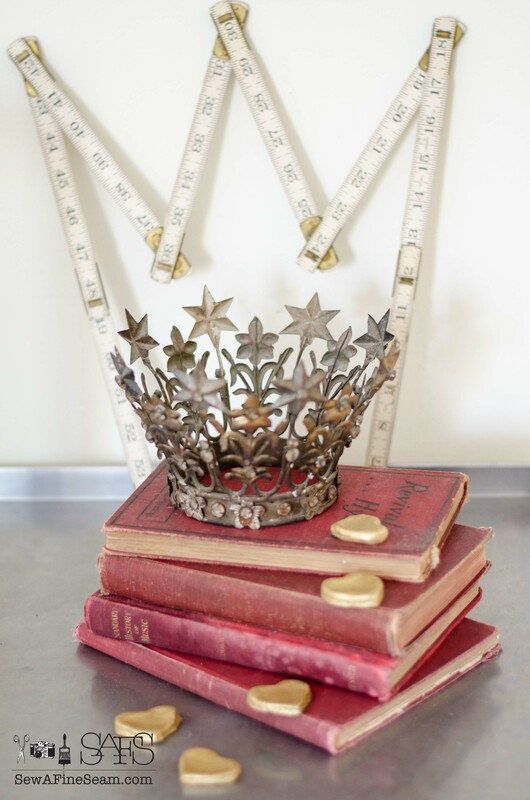 The little touches with meaning are definitely a big part of my home decor. Exactly! Real candy doesn’t stay around so using it as decor doesn’t really work! The salt dough hearts are super easy – I bet your kiddos could make them for you. I am of the “understated” Valentine decorating mode. Too much is too much after holiday decorating. Like to have some out to mark the day but that’s about it for me. We have Easter coming up and tend to do more for that holiday, have to look to see when Easter is this year. Your hubs sounds like mine, they like their candy handy. I love how you kept your decorating understated, very casual, not over top. Hope your little one will be feeling better very soon and you have your chicks back in your nest. Hope you’re having great week despite worrying about your youngest, poor kid, miserable being sick at all but away from home, not good. Take care. I Need to go look at your shop, see what all you have there, busy gal huh? Thanks JaneEllen, I’m quite happy with the bit of decor I did for Valentines this year 🙂 My girls are home and my baby is still sick. We will be calling our family Dr. in the morning. Jill, you rock! Thanks a bunch!